With innovation happening at such an incredible pace, it’s hard to find the time to try out all the new apps and technology that I come across, but every now and then, something grabs my attention and I think it’s worth investing an hour or so to try it out. Entale is one such example. I was introduced to the company by Start Up Marketer, Marc Duke and so just before Christmas I visited the offices of Founders Factory and met up with Hannah Blake, Entale Media’s Head of Partnerships and Business Development. Entale’s podcast player enables podcast produces to split the content into chapters, making it easier to navigate and discover. They do other clever things too, embedding images and links within each of the chapters. Some of the functionality needs improving – it will be great to push the images and links into the main player window in time with when they are relevant to the content – but I’m reliably informed by Hannah that her team have it all in hand. We should also not forget that people like to listen to podcasts on the commute, out running or in the gym, for example, and so the option to click on links or look at photos wont necessarily be appropriate at that time of listening, which is why I still continue to provide show notes for listeners to refer back to. 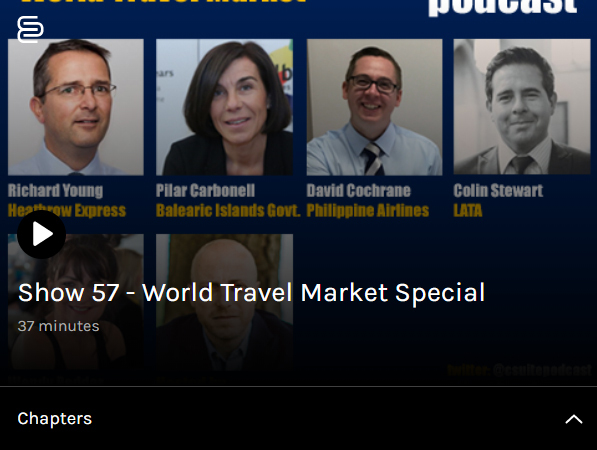 However, the chaptering of the content is a huge improvement to the experience, especially for those podcasts I produce from events, like the example I’ve embedded above, recorded from the World Travel Market in London, as part of the csuite podcast series, where you can now jump between the five interviews really easily. I’ve no set agenda in promoting Entale’s work. They asked me to trial their player and CMS, which was pretty easy to use, even at this early stage of it’s development. However, I would love your feedback on whether you think this is a good way to share content. Please do comment below or drop me a line directly using the contact form on the site or via twitter using @russgoldsmith.